Nick started small, but big results quickly got him hooked on building his best possible body. Learn how weight training has helped this hardgainer thrive! 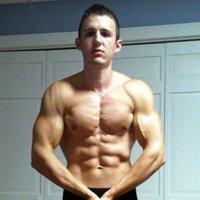 Age: 19 Height: 5' 8"
I am a hard gainer and have always been small. I was barely 100lbs. when I started, but I wanted to get bigger. I started lifting in my garage on a Weider set. As soon as I began to see results, I was hooked! I joined up at my local gym about 8 months later and that's when the journey really began. I use different techniques when training so my routines never get stale, but they all have the same basic structure. I train four days a week, with Wednesdays and the weekend off, unless I'm cutting in which case I'll add some light cardio on my off days. I eat 6 times a day with my meals spread out every 2-3 hours. My main focus is to stick with complex carbohydrates and lean proteins while also keeping my fat content at a reasonable level. I tend to only stick with some of the more basic supplements, the one's that should be in everyone's regime in my opinion. I'm currently taking Muscle Feast's Maltodextrin along with their Casein Protein. The only other supplement I take on a daily basis is EAS Whey Protein. I try not to get caught up in the supplement craze, so I keep it simple. Here's my daily regime. The body is a work of art and I love being able to change and mold it, and to have to power to sculpt it however I like. You almost have to have a sense of OCD as you want everything to be perfect in symmetry and proportion. It's not just a sport, it's a lifestyle. I also love the amount of discipline and determination it requires, it really sets you apart from any other athlete in any other sport. All of the benefits I reap on a daily basis from bodybuilding push me through life and help me live it to a higher, more enjoyable level. One of the best things that comes along with it is having great confidence in yourself and a high self-esteem. This is something that you take out of the gym with you and apply to ever single area of life, no matter what it is, and that's what keeps me going. Being skinny growing up in life, I always wanted to be bigger. Ever since I started lifting I've always been trying to become bigger and stronger and constantly better myself during my workouts. Every workout I'm either trying to add 5 more pounds or do just 1 more repetition than the week before. It's the longest battle of life, as you fight every day for just a little bit more of muscle. I'm currently cutting for the summer, with hopes of competing in the NPC as early as late spring. I'm also currently working as a personal trainer and majoring in Kinesiology so I plan on living a healthy lifestyle until the day I die, and helping others do the same. Bodybuilding has 4 components: Exercise, Nutrition, Sleep/Recovery, and Supplementation. I listed supplementation last because lots of people get caught up in it and they are meant to "Supplement" your diet and not serve as one. Also my number one rule is you must be patient. You will never transform your body overnight, even with drugs. So be patient and never get discouraged. If you put in the time and the work, you will see results! Victor Martinez, Shane Giese, and Jonathan Lawson. The supplement store and all the articles. The best way to learn is to read, and there is plenty to read on here, no matter if you're a beginner or a veteran, there is always something you don't know that you can benefit from.